I thought that the best way to make my tulpa grow would be to keep a progress report here. So basically, I discovered tulpamancy a week ago, while doing research about imaginary friends. 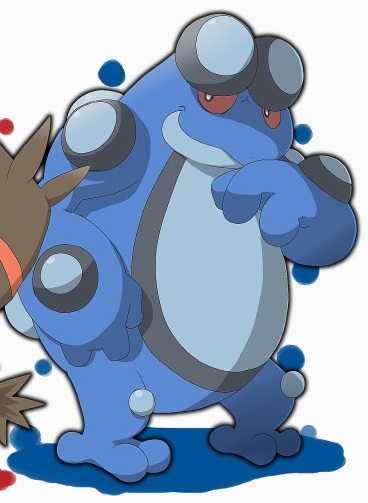 I've had a Seismitoad imaginary friend for about 2 years, that I am now promoting to a tulpa. I think I've read almost every guide this forum has to offer. But there are just so many of them, and they all say different things, so I'm still pretty lost. I feel like my tulpa has a real personality. He's very talkative, and I'm able to have real conversations with him, but I still feel like I'm just parroting (even though I try not to fall into parrotnoia), and his voice tends to change sometimes. I'm only hearing him through my mind's ear. For now I can only talk to him when I'm thinking about him; so he cannot talk to me when I'm thinking about something else. If you want to talk to him, I can be "proxying" what he says. Do you people actually vividly hear your tulpa talking? I mean with a real voice like a friend's one, not your mind's ear? Can your tulpa interrupt your train of thoughts to talk to you? Or basically, can your tulpa talk to you without you thinking about them? If so, how much time did it take for them to "learn" to do that? Am I doing something wrong? Most importantly, am I doing anything wrong? Yep, this is a real question. I prefer to ask before spending six months doing the same stupid mistake all over again. I can only hear mine with my "mind's ear", after nearly three years of hosting tulpas. I'm in no rush to impose their voices though. I can't remember how long it was for everyone else, but Nevira had been talking for maybe two weeks before it happened for the first time. And even then just a couple of times until much later. The feeling of parroting makes sense if he is coming from an imaginary friend state. Try to feel his preferences if you can. Give him some freedom to decide what you do. Mind's ear, real ear. Our system can't really distinguish. They sound the same, except the mind's ear sounds like it is coming from inside the head. We can interrupt each other. Sometimes. Even when neither of us is thinking of the other. This takes a lot of time to happen though. Uh, four months? The guides say different things because there are many methods and perspectives, so you need to find out what you think would work best for you, and if it doesn't go well, experiment until you find something that does work. With enough practice, yes, you can "hear" your tulpa like anyone else. This is auditory imposition and is mentioned in a lot of the general guides. If your tulpa is developed enough, they can definitely interrupt you and start interactions without warning. I think that it'd be pointless for people to tell you how long it took for them to reach that point, though, as everyone progresses differently. What you're doing sounds fine, and try not to worry too much about doing things wrong. Thank you guys for your answers. I guess I just have to keep spending time with my tulpa and keep exercising. I may be trying to rush things a little bit, since my tulpa is only 1 week old and I already expect him to be fully sentient and stuff. I don't really have anything interesting to post here, at least for now. I've been reading other people's progress reports, and they all seem to get amazing results in a short amount of time. Actually, I think I'm just getting paranoiac at this point. I'm doing fine. He doesn't believe in himself enough. Yeah, that's right. Can tulpas have their own musical tastes? I feel like my musical tastes have changed since Seismitoad's been around. I asked him, and he said that he doesn't know if he has something to do with it. Maybe it's just me, who knows. I think I'm getting there! Seismitoad and I have been feeling like he's getting more and more independent. I don't really feel like I'm parroting him anymore, and when I do, I just stare at him, waiting for him to give me an genuine reply, until I feel like it comes from him and not me. Works pretty well actually. I unfortunately haven't been able to spend much time with him lately, because I took the opportunity to see a lot of friends and socialize a bit. He isn't mad at me, since we both think tulpamancy shouldn't keep me from having social relations. But he's still a little sad about it, and I can't blame him for that. So yeah. I also thought Seismitoad should be more present in my PR. So here are his words I'm typing for him. Ok, so hi everyone? Uhh nice to meet y'all. Seriously, what do you want me to say in here? Do people actually read that thing? Also yeah we have a question, apparently Yoxiz thought it would be funnier if I asked it for him. Hey don't write that! So since the very beginning, we've been thinking about possession and stuff. Should we practice it early? Or should we wait until I get more "sentient" and "independent" from him? Because we don't really think it'd have a point if he was still "parroting" me while being possessed, that would just be him convincing himself it's not him. Anyway, have a good night everyone. As for us, Yoxiz should really go to bed. You heard him, I should sleep. I'm signing off for now. I think at least one person reads this. Though you can look at the viewcount as well. Possession is harder early. But there are no risks to practising it. I have heard one person got scared off of tulpamancy by the alien feelings of possession. (03-01-2017, 01:00 AM)tulpa001 Wrote: Hello Seismitoad! Hi! Yeah I know some people read this. I was messing with my host by saying that. Quote: Possession is harder early. But there are no risks to practising it. I have heard one person got scared off of tulpamancy by the alien feelings of possession. Good to know, thanks. But I'm not sure I really understand the concept of "alien feelings". I've seen it mentioned a few times in the french translation of Kiahdaj's Absolute Guide To Tulpas, but it wasn't of any help since the translator just kept "alien feeling" without translating it or giving any explanation about what it is. From what I remember of that guide, Kiah mainly said some people get "Alien feelings" from possession. The truth is there is a large variety of experience, and early on it usually feels like you are doing it yourself, but at the same time, weird. Il n'est pas le même pour tous le monde. Edit: Oh, and he talked about a feel attached to your tulpa, and tingles and fire. I think.